The Puritans were a Protestant religious faction and the term came into general usage at the end of the reign of Bloody Mary and the start of the Elizabethan era. A broad definition of puritans is 'those who wanted to completely change the Church of England, with its Roman Catholic type of structure and traditions, for another reformed and plain church model'. This strict religious view spread to encompass many social activities within England moving to a stricter code of conduct which deplored any kind of finery or flippant behaviours. The Puritans deplored the Globe Theatre. 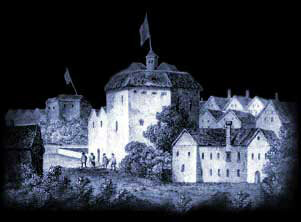 The Globe theatre and its plays were a new idea, a new form of entertainment for Londoners. The Globe theatre attracted huge crowds - up to 3000 people. The theatres were also used for bear baiting, gambling and for immoral purpose. It appealed to young people and many apprentices were said to have been lured to the theatres instead of working. The crowds attracted thieves, gamblers, pick-pockets, beggars, prostitutes and all kinds of rogues. Many Londoners were strict Protestants - Puritans in fact, who abhorred the theatres and many of the people they attracted. Objections by the Puritans to the theatres escalated and were supported by other Londoners. Respectable citizens were concerned about the rise in crime and the bawdy nature of some of the plays, fighting, drinking not to mention the risk of so many people and the spread of the Bubonic Plague! The end of the Globe Theatre was in sight. In 1642, under the force of the Puritans, the English Parliament issued an ordinance suppressing all stage plays in the theatres. The Puritans, lead by Oliver Cromwell, who had been elected to Parliament came into total conflict with the Royalists lead by King Charles I and the English Civil war broke out. In 1644 the Globe Theatre was demolished by the Puritans. In 1647 Even stricter rules were passed regarding stage plays and theatres. This culminated in 1648 when all theatres and playhouses were ordered to be pulled down. All actors were to be seized and whipped, and anyone caught attending a play to be fined five shillings. In 1649 the Civil War finally lead to the terrible execution of King Charles I . In 1653 Oliver Cromwell becomes Lord Protector of England. In 1658 Cromwell died and the power of the Puritans started to decline. In 1660 King Charles II was restored to the throne of England. With the Restoration of the English monarchy and , and the demise in the power of the Puritans in 1660 the theatres finally open again. But the Globe Theatre was never re-built - until 1997. Interesting Facts and information about the Globe Theatre Puritans. Additional details, facts and information about the Globe Theatre can be accessed via the Globe Theatre Sitemap.